yellow means the Club may be closed, based on Day Leader's judgement. red means the Club will be closed. Note that current low tides are around 0.4 feet higher than predictions. Unless whiteboard shows today's date, there is no Day Leader or they haven't signed in yet. Membership costs just $120 for 3 months ($99 for students and seniors) plus 2 hours volunteer work and there are no charges for lessons, equipment use, cruises, or other club activities. Choose About CSC for more information, to join, See plans and pricing. Once you've signed up, you'll need your Membership # from your invoice or confirmation email. If you forget that, check with the dayleader (they have the list of current members) or better yet, login again with your username and password and go to Account Info . Welcome aboard! Welcome to CSC! We're trying to keep the dinghy yard orderly to make different boat types accessible and everyone's life easier. The new layout is here. Please follow this when putting dinghies away. 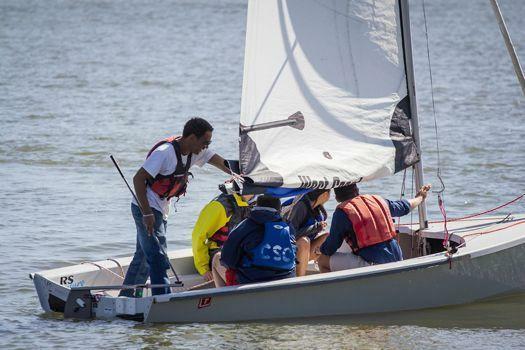 A dinghy sailing program for CSC members to advance toward their Junior Skipper Rating. 5 pm to sunset, intensive (1 on 2) instruction. These pre-requisites must be completed by Club dock time on Sunday, May 5. Juniors/Seniors - Want to help? Wand food and volunteer hours? 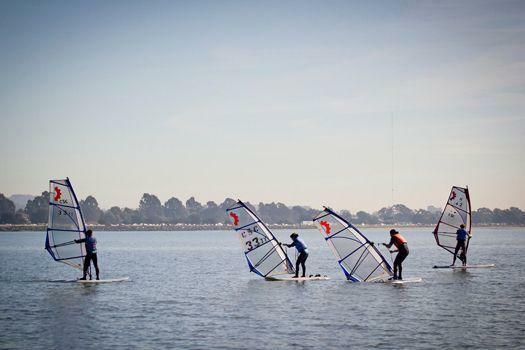 Instructors (Junior and up) needed Mon-Thurs, testers (Seniors and up) needed Thurs-Fri. Send email to Daniel Boldi, the coordinator, if you can help. If you don't have email, ask the Day Leader to contact Daniel. Volunteer hours, food, and fun available! 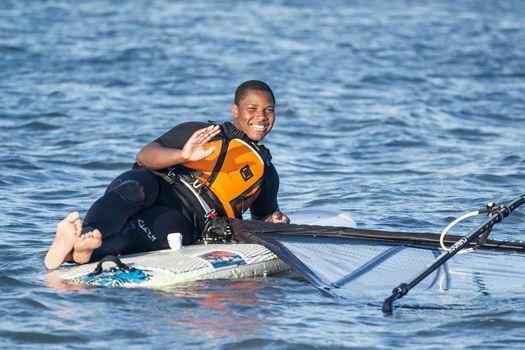 Advanced Dinghy lessons are back for the spring/summer on Monday evenings, April 29 through the end of August except for Fast Track weeks and holidays. 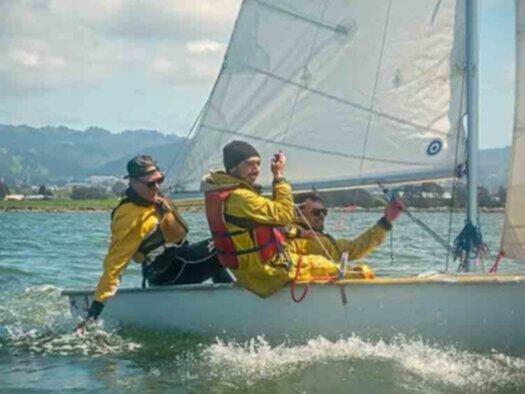 These lessons are intended for Juniors who would like to enhance their sailing skills (thinking of senior rating?). If you are a recently rated junior, it's a great opportunity to open new horizons for practice. And they are good review for Seniors, too. If you are a novice or non-rated yet but close to taking your test and interested in any topic covered by this class, you are welcome to join for the dock talk. Depending on the people present, you may be able to get on a boat for the on-water practice, but if you're not close to Junior, you probably won't learn much. Lesson schedule is here. We will rig the boats at 5PM, lessons will start at 6 with a dock talk followed by on-the-water practice and feedback around snacks after we put the boats away. For more info, contact Tony. Music jam at the club. Come and join the jam, sing along, dance, whatever. Bring your favorite musical instrument of just grab one next to you. The more the merrier. This will be every Saturday and Sunday from 2pm to dusk. We need volunteers to set up and break down audio equipment (counts as volunteer hours). There's a great video here. You can chat, ask questions, and make suggestions here. There are lots of ways to earn volunteer hours at the Club, and here's a new one – refer a friend. If you refer someone who becomes a member, you'll get 2 volunteer hours, which is what you need to renew your quarterly membership. Just tell your friend to enter your name in the "Referred By" field when they sign up. You'll get credited with the hours within a week or so after they sign up and get a subscription. Good deal all around – good for your friend, good for you, good for the Club. 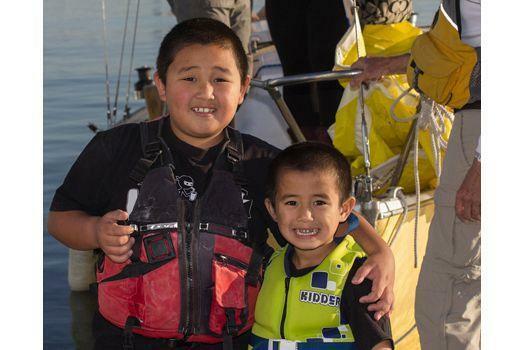 During Open Houses we offer FREE introductory sailboat rides to the general public aboard our fleet of keelboats and dinghies. Children must be at least 5 years of age and accompanied by an adult. Each Open House runs from 1-4pm on the dates listed above. More detailed information is here. 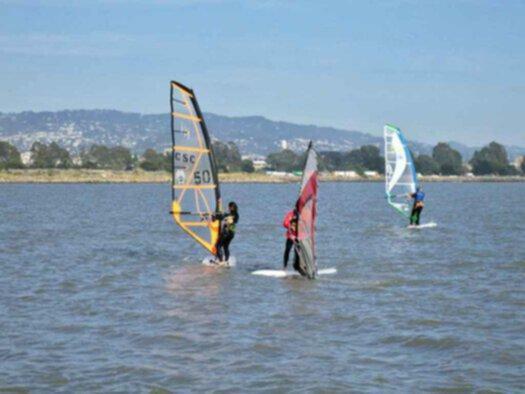 Saturday, April 6- Coincides with the Berkeley Bay Festival! Volunteeer hour requirements remain unchanged, including the number of hours for a free quarterly membership (10 in addition to your minimum volunteer hours, which depends on your rating - 2 for Junior and below, 10 for Senior and above). We are also establishing annual memberships based on volunteer hours (30 hours in addition to your minimum volunteer hours). A windsurfer in St Petersburg, FL, passed these on to us. Check them out here. Jack Chen produced this, and it covers inspecting, rigging and reefing a Quest, including putting the boat in the water with the hoist. 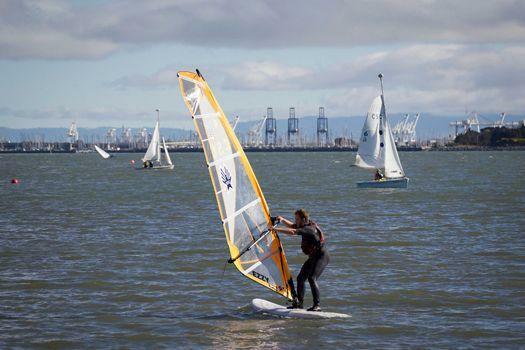 You can also find it in our library of instructional videos at Lessons->Sailing->Videos. Sheldon Coad took these photos with the help of Bobby Arthurs, and the club skiff. They circled the Reef and took photos in several directions. Pretty impressive when you see it, and pretty dangerous when you can't. 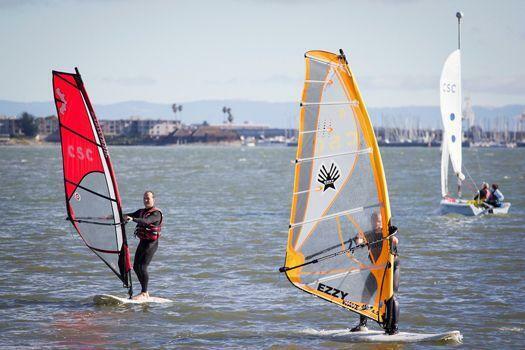 Click here for a more detailed description of the windsurfing rating requirements. We have also started something to help you get your Senior rating. To see how it works, click here. Want to get a rating/sign-off but don't know who can do it? 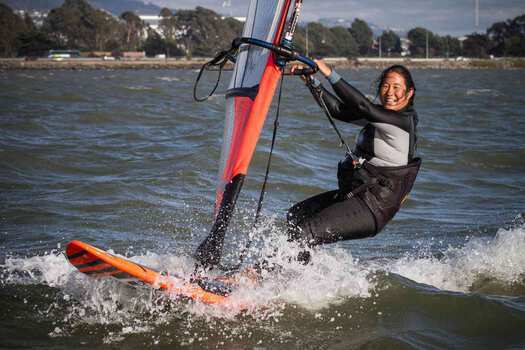 Click here to see who can sign off on which ratings/tests/check-outs (e.g., the Day Leader can sign off on Novice Windsurfer written and self-rescue). If you are logged-in to the website, you will be able to see a list of members who have the qualification needed (e.g., a list of those signed-off on the Laser who can then sign-off others). This link is also visible when you look at your White Card on the website. 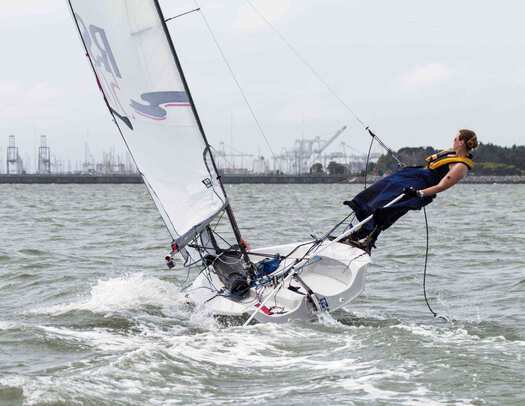 Can't make the normal Monday, Thursday, Saturday sailing lessons? Or just want some extra focused time in smaller groups? Then this is for you. A small number of instructors are making themselves available for lessons outside the normal sessions. 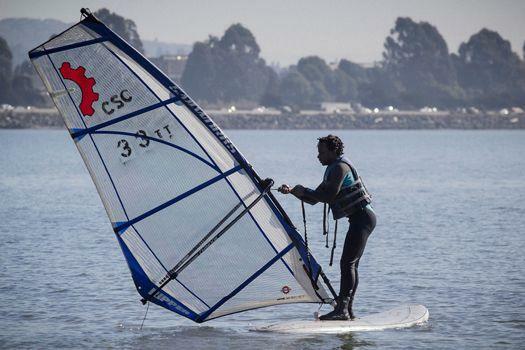 To see the details and a list of instructors and what they teach, go to Lessons->Sailing->Lessons on Demand. You will have to login to the site to see the contact information for the instructors. 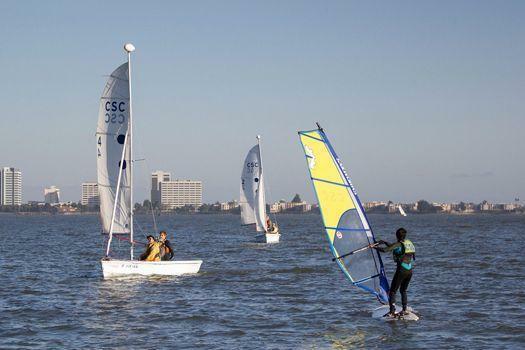 Beginning Dinghy Sailing lessons on Saturday mornings and Monday and Thursday afternoons. 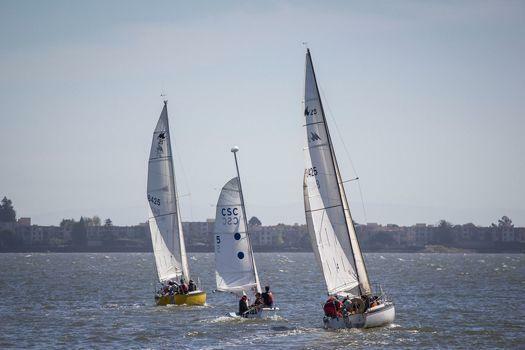 Keelboat lessons on Wednesday evenings. 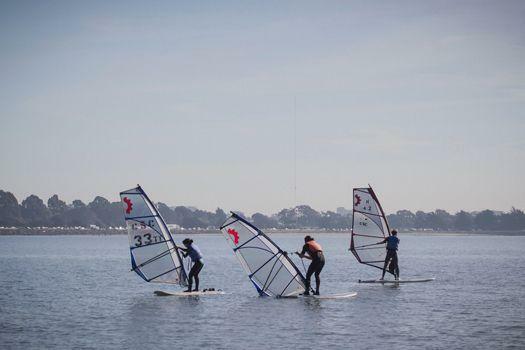 Windsurf lessons are held on sunny, breezy Saturday mornings, and on Sunday mornings too when the warm weather begins. Please see the lessons page for more information. Get to the club early!